Back in Vegas again for another Muse concert! And for my birthday! Yes! 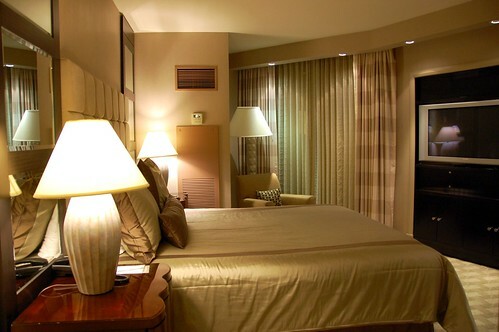 Mr. Monkey's father got us another free suite, this time at THEhotel, which was perfect because the Muse concert was at the adjoining Mandalay Bay, and we had another $50 restaurant.com gift certificate for a Mandalay Bay restaurant. Hooray for convenience and discounts! The living room was perfect for entertaining our pals, the Oros and the Vegases, before and after dinner and the Muse concert. 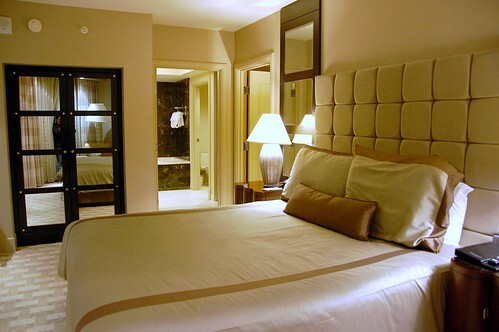 The bedroom was spacious and comfortable. 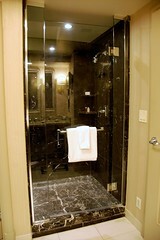 The bathroom wasn't too shabby either. A flat-screen TV is always a good thing. Mr. Monkey loved the complimentary bath salts. Shh. Don't tell him I wrote that. Your secret is safe with me :-). What an awesome score! Papa Monkey is da shiz for all the freebies that he scores for you guys! You lucky Monkey! 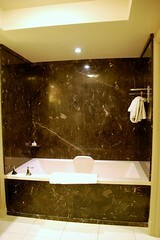 Our room was amazing too, watching plasma flat screen while in the tub? check. Comfy beds? check. I personally loved the complimentary shoe buffer. Did they still have that? That thing has come in so handy for me! Also, does THEhotel still have the distinctive almond (or something) smell? It smelled SO GOOD there! I remember that. But we were there after it has just opened, so wondering if things had changed. 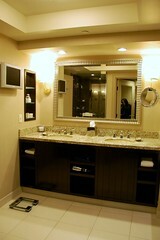 The flat screen in the bathroom is my favorite feature in the new swanky hotels in Vegas. Makes getting ready so much more fun! 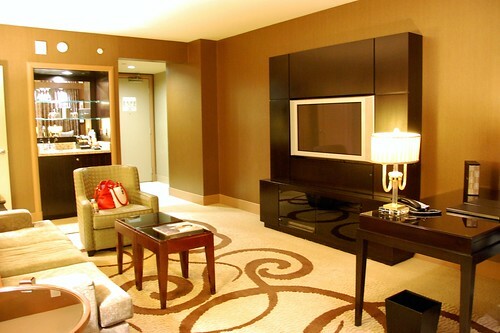 That's the type of room we stayed at when Mark proposed to me. Had a private dinner and butler and everything in the living room! You can pass this secret along to Mr. Monkey....when I took the hubs to Mandalay Bay for his birthday, the first thing he did was run himself a nice bath. So according to my calculations, your vegas trips come out to about $1/person or so? ;) Lucky monkey! That bath tub looks heavenly. it totally cracks me up that if not for the baseball scene in twilight, i'd have zero idea of who muse is. but i do like that song. that counts, right? ZOMG, I just had some of those macaroons at an event this weekend and am still thinking about them. Love them! That is one jazzy classy spot! What a rad place to stay! My new fave hotel thing is dual bathroom sinks. A+.